This winter, the Double H Ranch welcomed the Dittus Family – parents Mike and Lisa, and kids Brodie and Carter – to camp for the first time for a Family Sleepover Weekend. 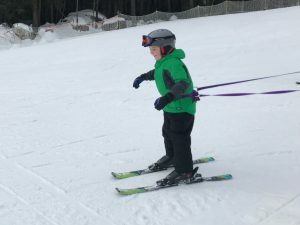 Double H Ranch offers five Family Sleepover Weekends for families who travel a long distance to participate in the Adaptive Winter Sports Program. 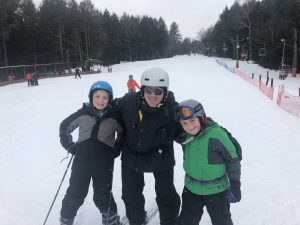 Family Sleepover Weekends allow the entire family to experience outdoor activities together – from ski and snowboard lessons to activities including sledding, movie nights, and camp fires. For Mike, he felt excited about the opportunity for his family to participate in the Adaptive Winter Sports Program but also had some reservations. Carter, his youngest son, had skied in the past but has been reluctant to go the past couple of seasons. Much of this is because of fatigue caused by Carter’s multiple diagnoses. “At first Carter was off balance and not steady on his skis. However, due to the patience and positive energy of both of his instructors, it was a short time until he was smiling and having the time of his life. It was truly a joy to see,” said Mike. 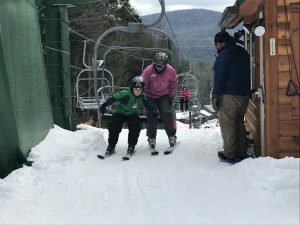 The Adaptive Winter Sports Program at Double H Ranch is made possible through the dedication and efforts of over 200 volunteer ski and snowboard instructors. Each season, instructors complete training under the guidelines of Professional Ski Instructors of America (PSIA) in Adaptive Education. “[The instructors] brought out the best in him and infused him with self-confidence. By Saturday, Carter’s positive experience turned into sheer magic! I couldn’t believe my eyes when Carter was up on the chair lift coming down from the top of the hill. My wife Lisa, Carter’s older brother Brodie, and I could not have been prouder of him. He truly had one of the best experiences of his young life,” said Mike. How did it feel when you were at camp? It felt like we were at a place where people were just happy and friendly. I’m talking volunteer, staff and guests alike. Everyone was smiling, happy, and having a great time! What did your family love most about your experience at Double H Ranch? 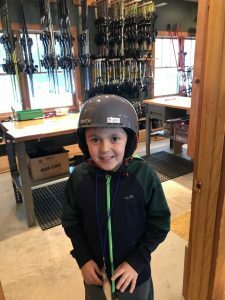 We loved the attention they gave our son Carter in teaching him to ski. All weekend he had two instructors working with him and he had a wonderful time. He did extremely well on the slopes. By the time we had left, Carter had made so much progress. He didn’t want to leave, and he asks every day when he can go back! Seeing him smile, laugh, learn, and improve was incredible for my wife and me. What do you think other people should know about camp? Double H Ranch is full of people who are so caring and so kind. They truly give themselves to the guests and to the children. It’s incredible to see, it’s magical. Was there a moment or memory from your family weekend that stands out for you? The moment that stands out the most is when Carter graduated from the conveyor lift and went up on the chairlift. To see Carter’s face so full of joy was an absolute gift – I’ll never forget it! “To us, camp is…” a place I want to come to again and again. I also want to give back as a volunteer sometime if they will have me. It was truly one of the best experiences my son has ever had. Thank you, Double H Ranch! >>You can help make these magical experiences possible by making a donation! Every donation helps us provide these extraordinary camp experiences to campers and their families – always free of charge.